The GW School of Business is proud to present a new series of 30-minute moderated interviews with notable alumni and respected thought leaders in the business, government and nonprofit arenas. 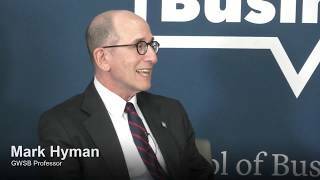 At the GW School of Business (GWSB), we strongly believe in the concept of lifelong learning for all members of our family, including our students and alumni. Our guest speakers and moderators will share insights on a range of topics including technology, leadership, global developments, ethics, and other timely areas of interest. 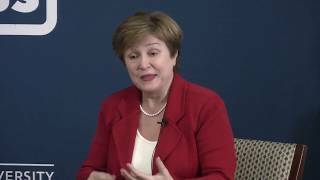 If you missed the George Talks Business event on April 22 featuring Kristalina Georgieva, chief executive officer of the World Bank, you can view it here and share with your colleagues. The 13th George Talks Business event will be held on Friday, April 26. Christine Brown-Quinn (MBA’92; Managing Director, Women in Business (WIB) Consulting, Ltd.), Carrie Potter (MBA’01, BBA’99; President, The Carrie Potter Group, LLC. ), and Isabella Zhang (BBA’14; Senior Associate, Ernst & Young) will participate in a panel discussion moderated by Mr. Mitchell E. Blaser (BBA’73 & Former GW Parent; COO, Ironshore Inc. and Chair, GWSB Dean's Advisory Council). For more information, please contact Irina Orlova. Can't attend in person? Please register below and tune in to the live stream on the GW School of Business Facebook page or YouTube channel. 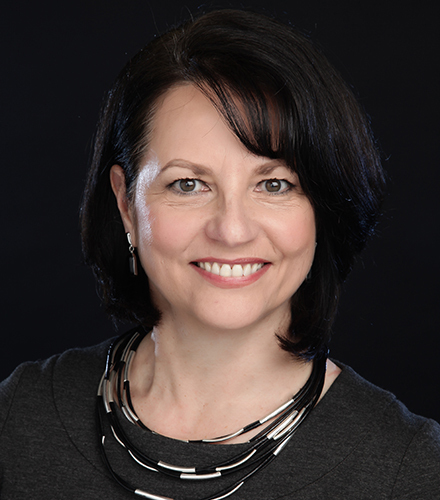 Following nearly 30 years in business, Christine Brown-Quinn embarked on a new career in 2010 as The Female Capitalist® to share with professional women practical, hands-on business strategies for career progression and work-life balance. As a former Managing Director in International Finance, Christine is well versed in what it takes to forge a thriving career in highly pressurized "alpha" environments. Through her webinars, coaching and in-person workshops, Christine unveils what really matters in getting ahead in the corporate world. She is also a published author: Step Aside Super Woman: Career & Family is for Any Woman (2011) and Career Success: Knowing the Unwritten Rules Changes Everything (to be published in the fall of 2019). Christine has an undergraduate degree in foreign languages from Georgetown University and an MBA in International Business from the George Washington University School of Business, where she currently serves on the Dean's Board of Advisors. Carrie Potter provides business consulting and financial planning services to professional athletes and small businesses. Potter advises her clients on business strategy and all areas of finance, including estate and investment management. She is a CERTIFIED FINANCIAL PLANNER™ (CFP) professional and Registered Investment Advisor in Texas. Prior to the launch of The Carrie Potter Group, LLC in 2006, she was vice president at PMG Sports in Washington DC. Carrie is also an adjunct lecturer with the Rice University Department of Sport Management. Potter is a founding member and president of Women in Sports & Events (WISE) Houston, which is the leading voice and resource for professional women in the business of sports. She is also the Chair for the Texas Executive Women Board of Directors. From 2009-2018, Potter served on the Houston Area Women’s Center Board of Directors, including two years as Chair and five years as Finance Chair. She earned two degrees in business, B.B.A. ‘99 and M.B.A. ‘01, from the George Washington University in Washington, D.C. and serves on the Executive Committee of the School of Business Board of Advisors, chairing the Student Experience Committee. Carrie is a Senior Fellow from Class XXXIV of the American Leadership Forum and after participating in Class 34 of the Center for Houston’s Future, co-chaired its 2018 Leadership Campaign and serves on its Steering Committee. 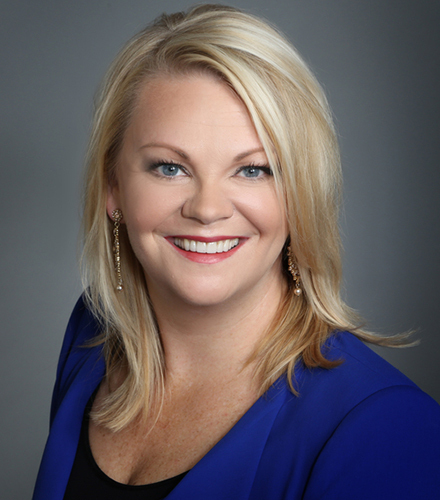 She was named a 2016 Woman on the Move by Texas Executive Women, a part of the Houston Business Journal’s 2017 40 Under 40 class, honored as a STEAM Role Model by the Greater Houston Women’s Chamber of Commerce in 2018 and was featured as a financial advisor on an episode of Discovery Channel’s Garage Rehab hosted by Richard Rawlings in 2019. When not serving clients or the community, Potter enjoys visiting those in need with her golden doodle Penny, playing golf, and cooking. Carrie was the first female student government president at The George Washington University; Valedictorian of Mercy High School in Omaha, Nebraska; and a writing assistant for The Babe Book: Baseball’s Greatest Legend Remembered, which was published in 2000. 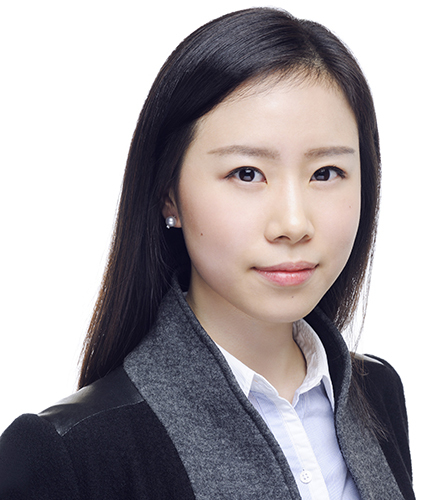 Isabella Zhang is a senior associate at Ernst and Young’s Transaction Support Practice in Shanghai. She serves both sell and buy side’s clients with detailed due diligence analyses, deal structuring and contract negotiations. Isabella joined Ernst & Young US’s audit practice in 2015 and transferred to Ernst & Young China’s Transaction Support practice in October 2018. Throughout her audit practice, she has worked on multiple public trade clients across Media & Entertainment and Life Science industry including Fortune 500 companies, emerging companies, and foreign subsidiaries. At the Transaction Support practice, she has been involved in domestic and cross-border transaction in various industry sectors, including manufacturing, education, and consumer products. Isabella is a Certified Public Accountants in the US and a Chartered Financial Analyst. Ms. Zhang graduated from GWU in 2014 with a Bachelor’s Degree in Accounting and in 2015, she received a Master's Degree of Professional Studies in Applied Statistics from Cornell University Graduate School. The 14th George Talks Business event will be held on Monday, April 29, 2019. Brazilian-born international artist and sculptor Romero Britto will be our guest. The 15th George Talks Business event will be held on Thursday, May 2. 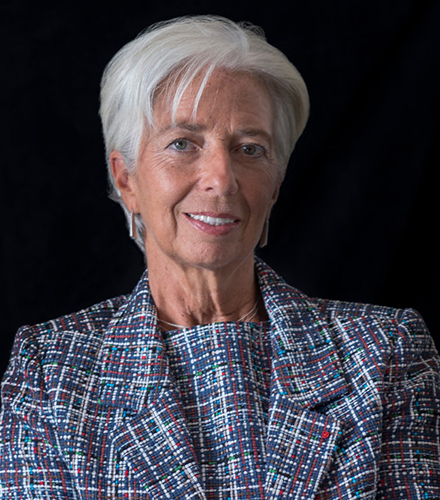 Christine Lagarde, managing director of the International Monetary Fund (IMF), will be interviewed by Danny Leipziger, managing director of The Growth Dialogue and professor of international business and international affairs at GWSB. Since July 2011, Christine Lagarde has been the eleventh and first woman Managing Director of the International Monetary Fund. She was reelected to a second five-year term in 2016. A lawyer by background, Christine Lagarde practiced for 20 years with the international law firm Baker McKenzie, of which she became global Chairman in 1999. In 2005, she joined the French Government as Minister for Foreign Trade. Two years later, she became the first woman to hold the post of Finance and Economy Minister of a G7 country. The inaugural George Talks Business event was held on Monday, January 28, 2019 in the 1st Floor Auditorium (Room 108) of Funger Hall. 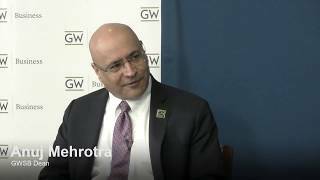 GWSB Dean Anuj Mehrotra interviewed GW President Thomas LeBlanc, and the event was followed by a reception in the lobby of Funger Hall. 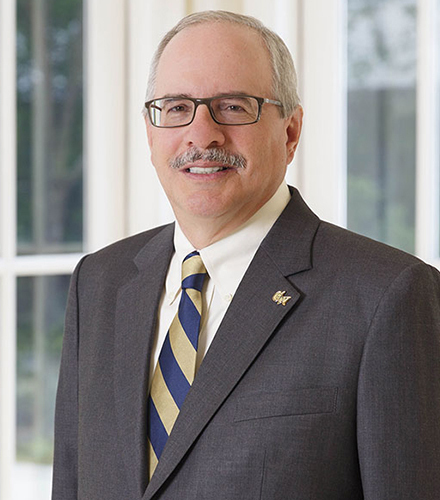 The Board of Trustees of the George Washington University unanimously elected Thomas J. LeBlanc as the university's 17th President on January 6, 2017. Dr. LeBlanc is an accomplished academic leader, who previously served as the executive vice president, provost and professor of computer science and electrical and computer engineering at the University of Miami. The second George Talks Business event was held on Monday, February 4 in Duquès Hall, Room 651. 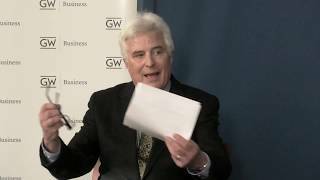 Dave Zilko (GWSB MBA '87), CEO of Fuel Leadership and former Vice Chairman of Garden Fresh Gourmet, was interviewed by Dr. Lex McCusker, director of Student Entrepreneurship Programs at GW. Dave Zilko founded his first specialty food company more than 20 years ago with a $2,500 credit card loan. While today Dave remains an equity partner in several food-oriented enterprises, he recently exited active involvement in the industry when he engineered the sale of Garden Fresh Gourmet, makers of the number one brand of fresh salsa in North America, to the Campbell’s Soup Company for $231 million. Dave was a partner at Garden Fresh for 13 years, serving as Vice Chairman with primary responsibility for strategy and sales. In 2016, Dave published a book, via Wiley & Sons nationwide, detailing his experience as an entrepreneur in general and his experiences with Garden Fresh in particular. The book, “Irrational Persistence: Seven Secrets That Turned a Bankrupt Startup Into a $231,000,000 Business,” has become a national bestseller. Today Dave has invested in and assumed the role of CEO at FUEL Leadership, a digital media property that also organizes exclusive business events. 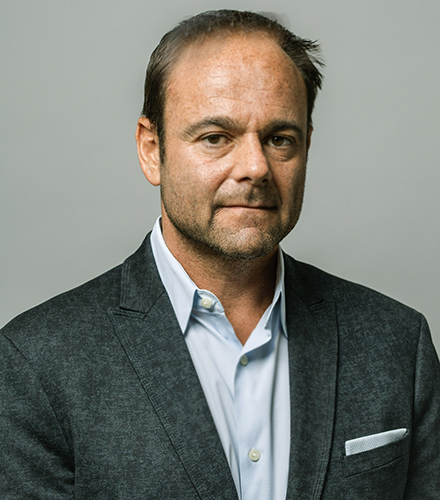 He is an operating partner at Huron Capital, a Detroit-based private equity firm with over $1 billion under management, and serves on the boards of the $60 million Grow Michigan venture fund; Jimmy Buffett's charitable foundation, Singing for Change; and the executive board of the largest food rescue organization in the country, Forgotten Harvest. Dave graduated from Michigan State University with a degree in finance and earned a Master of Business Administration in Marketing from the George Washington University. The third George Talks Business event was held on Monday, February 11, 2019. 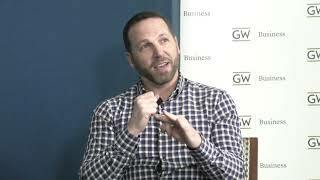 Dan Simons (GWSB BBA '92), founder and co-owner of Farmers Restaurant Group, was interviewed by Dr. Vivek Choudhury, associate dean for strategic initiatives at the GW School of Business. 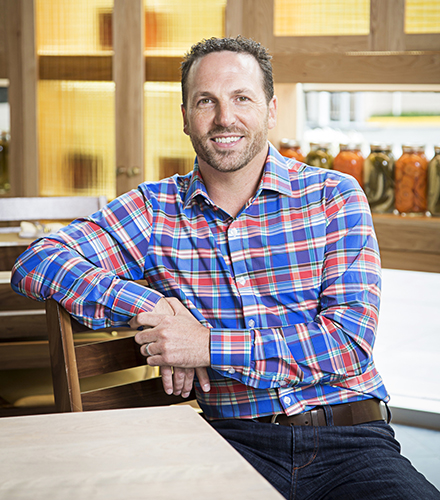 Within the industry and among his own team, Dan Simons is known for his energetic leadership style and passion for hospitality. An impressive career in the management ranks at several large, high-volume restaurants helped propel him toward starting his own firm, VSAG, which he founded in 2004 with mentor Michael Vucurevich. The two form a well-balanced partnership based on mutual respect and a shared vision, which proved critical in their formation of Farmers Restaurant Group (FRG) in 2011. As co-owner and skilled communicator, Dan is frequently called upon to serve as the voice of FRG’s growing group of restaurants. Whether inspiring potential investors, accepting multiple awards for the socially conscious ways of the restaurants or sharing his knowledge at hospitality and educational events, Dan is a champion for responsible industry standards and takes great pride in being able to continually incorporate sustainability methods and local initiatives that give back to the environment and the community. 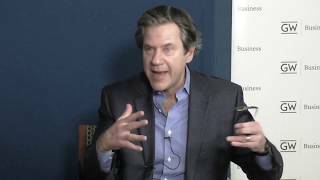 The fourth George Talks Business event was held on Monday, February 25. 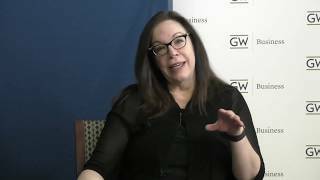 Dr. Donna Hoffman, Louis Rosenfeld Distinguished Scholar, Professor of Marketing, and Co-Director of the Center for the Connected Consumer at the GW School of Business (GWSB), was interviewed by Dr. Vanessa Perry, associate dean for faculty and chair of the Department of Marketing at GWSB. 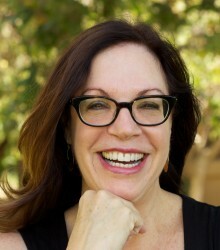 Donna L. Hoffman is the Louis Rosenfeld Distinguished Scholar and Professor of Marketing and Co-Director of the Center for the Connected Consumer at the George Washington School of Business in Washington, D.C. Professor Hoffman is an internationally recognized academic expert and sought-after industry speaker focused on consumer experience with AI devices, services, and systems. She has worked with major corporations on the topics of online consumer behavior and digital marketing strategy, including Procter & Gamble, Intel, Microsoft, FedEx.com, Land’s End/Sears, Walmart.com, and many others. She served as an Academic Trustee of the Marketing Science Institute and as a member of the Procter & Gamble Digital Advisory Board. Professor Hoffman publishes widely on the topics of consumer behavior in online environments and Internet marketing strategy in many of the top academic and managerial journals. Her research has been funded by the Alfred P. Sloan Foundation, the National Science Foundation and the Marketing Science Institute. Professor Hoffman’s work enjoys wide impact: she has over 26,000 Google Scholar citations and an H-index of 40 and has been awarded many of the field’s most prestigious research awards, including the Robert B. Clarke Educator of the Year Award from the DMEF, the Sheth Foundation/Journal of Marketing Award for long-term contributions to the discipline of marketing, the Stellner Distinguished Scholar Award from the University of Illinois, the William O’Dell/Journal of Marketing Research Award for long-term research impact and the Robert D. Buzzell Marketing Science Institute Best Paper Award Honorable Mention. She is also an MSI “Challenges of Communications and Branding in a Digital Era” research proposal competition winner and was recently named a finalist for the Paul D. Converse Award, for her lasting contributions to the marketing field. Her Ph.D. is from the L.L. Thurstone Psychometric Laboratory at the University of North Carolina at Chapel Hill and she was a faculty member at Columbia University, the University of Texas, Vanderbilt University and the University of California before joining George Washington University. She has also served as a visiting professor at UCLA, Stanford and USC. She was named a Distinguished Graduate Alumnus of UNC in 2002. The fifth George Talks Business event was held on Monday, March 4. 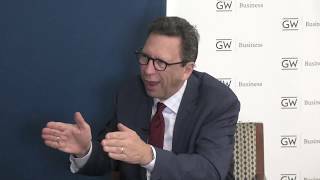 Frank Sesno, director of the George Washington University School of Media and Public Affairs, was interviewed by GW School of Business Dean Anuj Mehrotra. Frank Sesno currently serves as director of the George Washington University School of Media and Public Affairs, where he leads a faculty of nearly two dozen world-class faculty who research and teach journalism, political communication and the impact of digital media in international affairs. Sesno is an internationally recognized journalist with more than 30 years of experience reporting from around the world. He joined CNN in 1984 and for seven years was White House Correspondent, after which he moved to the anchor chair for the main domestic and global international newscasts. From 1996 through 2001, he served as the Washington Bureau chief and senior vice president. In this capacity, he oversaw the bureau’s editorial direction and supervised the network’s largest newsgathering operation — including its White House, Congressional, and Pentagon coverage, as well as its political reporting. For seven years, he hosted Late Edition with Frank Sesno, CNN’s flagship weekend interview program. He has interviewed five U.S. Presidents as well as numerous Nobel prize-winning scientists, renowned economists, Hollywood celebrities, CEOs, best-selling authors and leaders including Hillary Clinton, Israeli Prime Minister Benjamin Netanyahu, Microsoft founder Bill Gates, and broadcast legend Walter Cronkite. 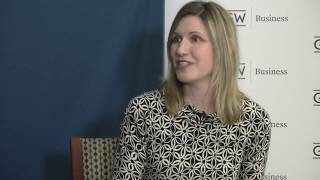 Sesno continues to conduct interviews and moderate conversations with political leaders and decision-makers, including through The Conversation Series at GW. He is the creator of Planet Forward at GW, a user-driven web and television project that highlights innovations in sustainability. Sesno hosts and facilitates the Planet Forward Salon Series focusing on topics such as energy policy, green jobs and food production. The sixth George Talks Business event was held on Monday, March 18. 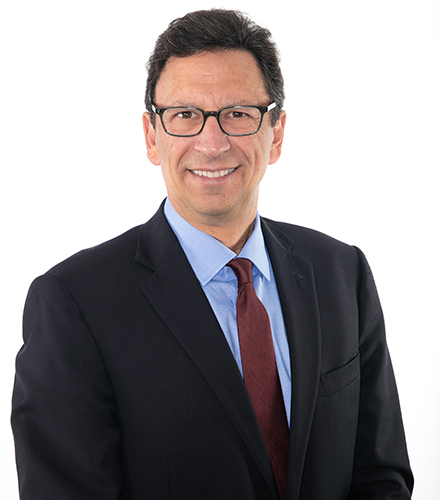 Gabriel Galvan (GWSB MBA '10), executive director of the MITRE Corporation, was interviewed by Christopher B. Leinberger, Charles Bendit Distinguished Scholar and Research Professor and chair of the Center for Real Estate & Urban Analysis at GWSB. Gabriel (Gabe) Galvan is an executive director at the MITRE Corporation. As a member of MITRE’s executive team, he works across the company to help promote safety in the United States and with governments across the world. He concentrates on MITRE’s cyber outreach and partnerships. Engaging across the globe on issues of security, his overseas efforts often include the themes of smart cities, cyber security and resilience, research and development. Today he leads an effort to launch a public-private partnership to increase cyber defense and to share valuable actionable information for its members in industry and the region. He is active in the Commonwealth Cyber Initiative, a Virginia-based effort to help align cyber and related technologies investments with activities of research, education and economic development in the region. 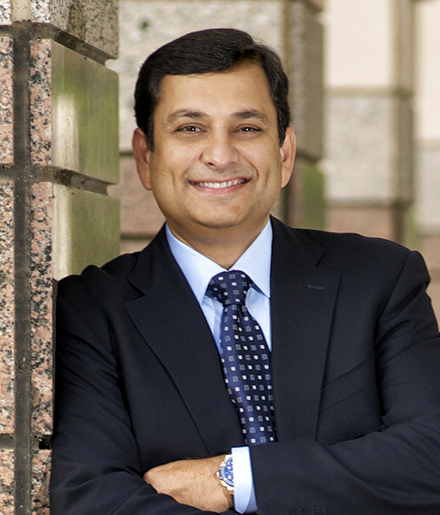 Gabe has held executive roles and international assignments in a variety of companies including the IBM Corporation, BMC Software and HP. His experience in business, management consulting, sales, services and public policy has been used to launch new businesses and help transform governments and organizations across the world. Gabe graduated with highest honors as valedictorian in his MBA studies from the George Washington University. He is a native Washingtonian and earned a BS in Business Administration from George Mason University and has additional studies in International Transactions from George Mason’s School of Public Policy. He remains active supporting the local university community and serves as a Board of Trustee to Marymount University in Arlington, Virginia. He is a member of the Atlantic Council and the Greater Washington Board of Trade, and he currently chairs the NVTC Committee on Cybersecurity and Privacy. The seventh George Talks Business event was held on Monday, March 25. Jennifer Vey, senior fellow with the Metropolitan Policy Program at the Brookings Institution and director of the Anne T. and Robert M. Bass Center for Transformative Placemaking, was interviewed by Christopher B. Leinberger, Charles Bendit Distinguished Scholar and Research Professor and chair of the Center for Real Estate & Urban Analysis at GWSB. Jennifer S. Vey is a senior fellow and the Director of the Anne T. and Robert M. Bass Center for Transformative Placemaking at the Brookings Institution. 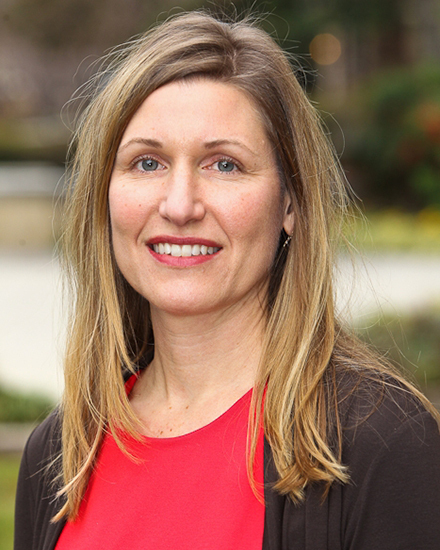 Jennifer’s work primarily focuses on the connection between placemaking and inclusive economic development in the digital economy. She is the author or co-author of numerous Brookings publications, including “Why we need to invest in transformative placemaking,” “Assessing your innovation district: A how-to guide,” and “Building from strength: Creating opportunity in Greater Baltimore’s next economy.” She also co-edited Retooling for Growth: Building a 21st Century Economy in America’s Older Industrial Areas, published by the American Assembly and Brookings Institution Press. Prior to joining Brookings in June, 2001, Jennifer was a Community Planning and Development Specialist at the U.S. Department of Housing and Urban Development. She earned a Master of Planning degree from the University of Virginia, and holds a B.A. in Geography from Bucknell University. She lives with her family in Baltimore. The eighth George Talks Business event was held on Monday, April 1. Tony Saldanha, president of Transformant, was interviewed by Dr. Vivek Choudhury, associate dean for strategic initiatives at the GW School of Business. Tony Saldanha is a globally recognized and versatile Fortune 25 company Global Business Services (GBS) and Information Technology executive with a rich blend of business and technology leadership expertise. Tony has over three decades of international business expertise in the US, Europe, and Asia. He was named on Computerworld’s Premier 100 IT Professionals list in 2013. 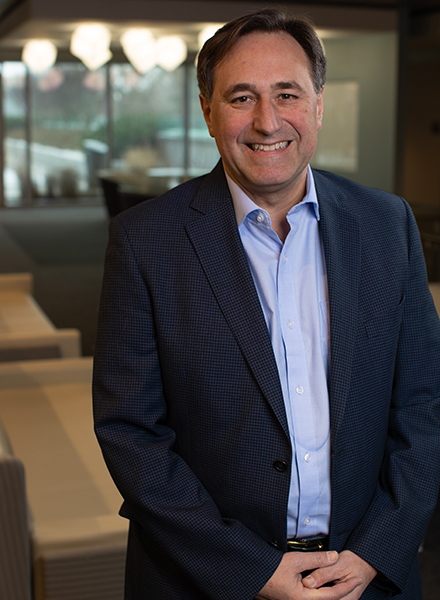 Tony brings a proven track record of GBS design and operations, CIO positions, acquisitions and divestitures, outsourcing, disruptive innovation, and experiences in creating new business models during a 27-year career at Procter & Gamble. Tony has board experience in industry organizations, in client advisory boards and in non-profit organizations. Tony is a recognized thought leader in the IT industry and is currently working on a book on digital transformation that is aimed at providing practical advice to boards and CEOs on executing sustainable transformation. During his latest role at Procter & Gamble, Tony took on the challenge of disrupting the already best-in-class $2.5 billion Global Business Services operation, after having run most aspects of it over the previous decade. This quickly became an undertaking to disrupt the global IT and shared services industry, given P&G’s leadership position in the area. Tony brought together peer Fortune 50 companies, the top global IT companies and venture capitalists to deliver this effort. Prior to this, Tony ran Global Business Services and IT for all P&G’s business units and 75 countries, as well as the Business Intelligence and Analytics function for P&G. As the leader of Global Business Services and IT for all units, he was responsible for creating new business models using technology in the business, in addition to delivering cost and service targets. As part of the latter position, Tony created new award-winning analytics and algorithm driven business models for selling, marketing, manufacturing and finance. The ninth George Talks Business event was held on Tuesday, April 9. 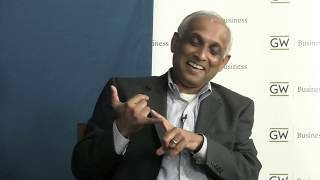 Manoj Saxena, executive chairman of CognitiveScale and former first general manager of IBM Watson, was interviewed by GW School of Business Dean Anuj Mehrotra. Manoj Saxena is the executive chairman of CognitiveScale and a founding managing director of The Entrepreneurs' Fund IV, a seed fund focused on the B2B AI market with nine active investments. Previously, he served as the first General Manager of IBM Watson, where his team built the first cognitive systems. 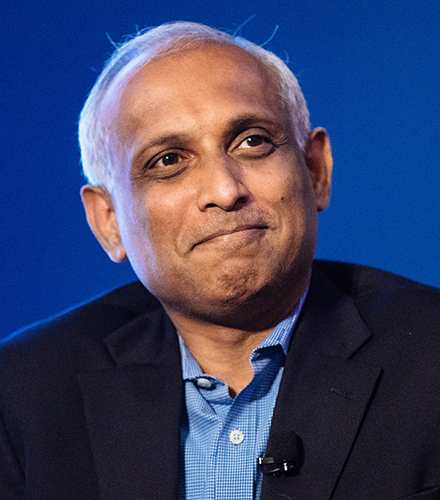 Prior to IBM, Saxena successfully founded and sold two venture-backed software companies within a five-year span. 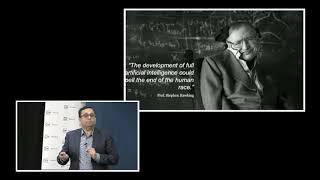 He currently serves on the boards of AI Global, a non-profit dedicated to promoting practical and responsible applications of AI, and the Saxena Family Foundation. Saxena holds a post graduate degree in business administration from Michigan State University, and a graduate degree in management sciences from the Birla Institute of Technology in Pilani, India. He is also the holder of nine software patents. The 10th George Talks Business event was held on Monday, April 15. 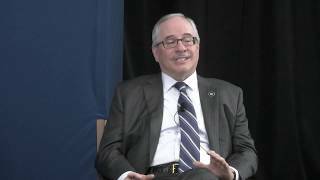 Doug Zarkin (BBA '92), vice president and chief marketing officer of Pearle Vision Luxottica, was interviewed by GW School of Business Dean Anuj Mehrotra. Recognized as a global strategic retail and brand marketing expert, as the vice president and chief marketing officer for Luxottica’s Pearle Vision Business, Doug has led the transformation of the brands global strategic marketing, e-commerce, visual merchandising, product promotion, and store design functions. His work with Pearle Vision is currently the subject of a Harvard Business case study on brand rejuvenation. Doug has earned an impressive array of honors for his marketing and brand building work, including The Innovation Award from The CMO Club, a Silver Clio Award, El Sol Award, Effie Award for Health Care Services Marketing (twice), WWD’s Best Executed Launch Strategy Award, the American Legacy’s Silver Halo Award for Cause Related Marketing, and the Bulldog Drummond Social Media Award for Best Social Media Platform. He’s also been named “Marketer of the Next Generation” by Brandweek and “One of the 15 to Watch” by The Youth Marketing Newsletter. 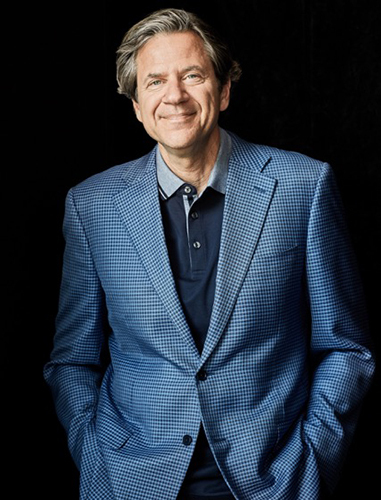 His public presence includes appearances on all of the major broadcast networks; in Forbes, The Economist, The New York Times, and The Huffington Post; and as a guest lecturer at many top universities, such as Harvard, NYU, Duke, Xavier, Miami of Ohio, and the Hebrew University of Jerusalem. The 11th George Talks Business event was held on Monday, April 15. Jon Miller, pre-eminent Major League Baseball broadcaster and National Baseball Hall of Fame 2010 Ford C. Frick award-winner, was interviewed by GWSB Professor Mark Hyman and Ryan Delaney (BBA '19), President, Sports Business Association. 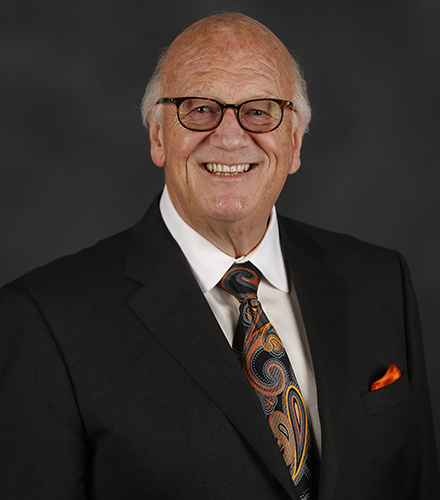 Jon Miller, honored by the National Baseball Hall of Fame as the 2010 Ford C. Frick award winner for baseball broadcasting excellence, the “Voice of the Giants”, enters his 22nd season in the broadcast booth on KNBR Radio, NBC Bay Area and NBC Sports Bay Area. Miller was thrilled to broadcast his 16th World Series in 2014 as the Giants won it all for the third time in five years. Miller was inducted into the National Radio Hall of Fame in 2014. In 1990, when ESPN TV first began its coverage of Major League Baseball, Miller was chosen as the first play-by-play commentator on the award-winning ESPN Sunday Night Baseball game of the week broadcast. Miller and his Hall of Fame partner, Joe Morgan, teamed up on the prime time telecast for 21 seasons. During his tenure at ESPN, he was nominated twice for a national Emmy Award, and broadcast 13 consecutive World Series on ESPN Radio. He has broadcast 16 World Series overall. He was also nominated six times for an “ACE” award, emblematic of cable television excellence, and won the award in 1991 - the first ESPN play-by-play announcer to win the award, and 1996. Miller was named National Sportscaster of the Year by the American Sportscasters Association (ASA) in 1998. That same year, Miller was inducted into the Hall of Fame of the National Sportswriters and Sportscasters Association of America (NSSAA). In 2016, Miller received a Northern California Emmy Award, the third local Emmy for his Giants television work. Prior to his work on ESPN, Miller broadcast an occasional game on NBC-TV with either Tony Kubek or Joe Garagaiola. Miller spent 14 years with the Baltimore Orioles before coming to the Giants. Prior to joining Baltimore in 1983, the talented broadcaster spent two seasons with the Texas Rangers (1978-79) and three seasons with the Boston Red Sox (1980-82). Miller got his first baseball play-by-play job in 1974 at age 22 calling radio and TV for that year’s World Series Champion Oakland Athletics. The Bay Area native has also broadcast NHL hockey, NBA basketball and championship soccer games on national television in his distinguished career. In 2018, Miller was inducted into the College of San Mateo (CA) Hall of Fame. Miller began his broadcasting career as a student at CSM and broadcast baseball, football and basketball games on KCSM, the college’s radio and TV stations. Jon and his wife, Janine, reside in Moss Beach. They are parents to three daughters, Misha, Holly (married to Paul Gallagher) and Emilie, and a son, Alexander. The 12th George Talks Business event was held on Monday, April 22. 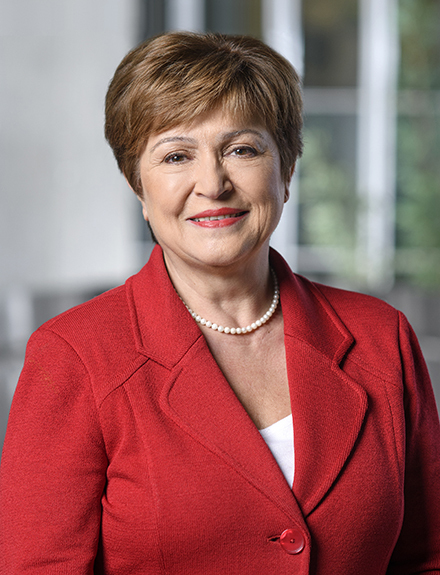 Kristalina Georgieva, chief executive officer of the World Bank, was interviewed by Danny Leipziger, managing director of The Growth Dialogue and professor of international business and international affairs at GWSB. Previously, Georgieva, a Bulgarian national, played a leading role in shaping the agenda of the European Union, first as Commissioner for International Cooperation, Humanitarian Aid and Crisis Response, and later as Vice President for Budget and Human Resources, in charge of the European Union's €161 billion budget and 33,000 staff around the world.